Soil samples (from topsoil 0-20-cm) were taken from 111 points on an approximately 20-m grid in March 2009. Using a geographic Information System Software Platform (ArcGIS), the soil sampling points from the primary scheme were regularly deleted to create three sampling scenarios. Twelve chemical properties were analyzed by geostatistical techniques at three sampling intervals. Results indicated that the twelve properties showed strong spatial variability at the three sampling intervals. The reasonable sampling intervals of soil available phosphorus (AP), available potassium (AK), cation exchange capacity (CEC), Fe, Cu, and Zn were 20-m. In the 20 x 40-m sampling interval, soil alkaline hydrolyzable nitrogen (AN), total nitrogen (TN), organic matter (OM), and active soil OM (ASOM), had the least interpolation errors. Soil pH and Mn had the least interpolation errors at the 40-m sampling interval. Bao, S. D. (2005). Agricultural and Chemistry Analysis of Soil. Agriculture Press, Beijing (in Chinese). Bremner, J. M. and Mulvaney, C. S. (1984). Total nitrogen In: Methods of Soil Analysis, Page, A.L.(ED.). 2nd Edn. Agron. No. 9, Part 2: Chemical and Microbiological properties. Am.Soc. Argon., Madison, WI. USA. pp. 595-624. Chapman, H. D. (1965). Cation exchange capacity. In: Methods of Soil Analysis, Black, C.A. (ED.). Part 2. Number 9 in the series agronomy: American Institute Agronomy, Madison, Wisconsin. pp. 891-901. Duffera, M., White, J. G., and Weisz, R. (2007). Spatial variability of Southeastern U.S. Coastal Plain soil physical properties: Implications for site-specific management. Geoderma 137: 327-339. Ferguson, R. B., Hergert, G. W., Schepers, J. S., et al. (2002). Site-specific nitrogen management of irrigated maize: yield and soil residual nitrate effects. Soil Sci. Soc. Am. J. 66: 544-553. Franzen,W. D., and Peck, T. R. (1995). Field soil sampling density for variable rate fertilization. J. Prod. Agric. 8: 568- 574. Gaston, L. A., Locke, M. A., Zablotowicz, R. M., et al. (2001). Spatial variability of soil properties and weed populations in the Mississippi Delta. Soil Sci. Soc. Am. J. 65:449-459. Gotway, C. A., Ferguson, R. B., Hergert, G. W., et al. (1996). Comparison of kriging and inverse-distance methods for mapping soil parameters. Soil Sci. Soc. Am. J. 60:1237-1247. Goovaerts, P., (1999). Geostatistics in soil science: state-of-the-art and perspectives. Geoderma 89: 1-45. Haining, R. (1990). Spatial data analysis in the social and environmental sciences. Cambridge University Press. Hammond, M. W. (1993). Cost analysis of variable fertility management of phosphorus and potassium for potato production in central Washington. In: Proceedings of Soil Specific Crop Management Workshop, Minneapolis, MN. P. C. Robert, et al. (eds.). ASA, CSSA, and SSSA, Madison, WI. pp. 213-228. Han Jinfeng (2003). Tobacco Cultivation Physiology [M]. Beijing: China Agriculture Press, 2003:156. Chinese. Jiang, H. L., Liu, G. S., Wang, X. Z., et al. (2010). Spatial variability of soil properties in a long-term tobacco plantation in Central China. Soil Sci. 175: 137-144. Johnston, K., Hoef, J. M. V., Krivoruchko, K., et al. (2001). Using ArcGIS geostatistical analysis. GIS User Manual by ESRI, New York, NY. Kyaw, T., Ferguson, R. B., Adamchuk, V. I., et al. (2008). Delineating site-specific management zones for pH-induced iron chlorosis. Precision Agric. 9: 71-84. Lefroy, R. D. B., Blair, G., and Strong, W. M. (1993). Changes in soil organic matter with cropping as measured by organic carbon fractions and 13C natural isotope abundance. Plant Soil. pp.155-156, 399-402. Li, Y. B., Mao, S. C., Wang, X. H., et al. (2007). Cotton growth condition spatial variance analysis based on geostatistics. Cotton Sci. 19: 214-218 (In Chinese). Li, Y., Shi, Z., Wu, C. F., et al. (2007). Optimised spatial sampling scheme for soil electrical conductivity based on Variance Quad-Tree (VQT) method. Agric. Sci. China 6: 1463-1471. Lindsay, W. L., and Norvell, W. A. (1978). Development of a DTPA soil test for zinc, iron, manganese, and copper. Soil Sci. Soc. Am. J. 42: 421-428. Liu, G. S., Wang, X. Z., and Zhang, Z. Y. (2008). Spatial variability of soil properties in a tobacco field of central China. Soil Sci. 173: 659-667. Liu, G. S., Jiang, H. L., Liu, S. D., et al. (2010). Comparison of kriging interpolation precision with different soil sampling intervals for precision agriculture. Soil Sci. 175: 405-415. Liu, G. S. 2003. Tobacco cultivation. China Agricultural Press, Beijing, China (In Chinese). Liu, X. M., Zhao, K. L., Xu, J. M., et al. (2008). Spatial variability of soil organic matter and nutrients in paddy fields at various scales in southeast China. Environ. Geol. 53: 1139-1147. MacCormick, J. and Blake, A. (1999). A probabilistic exclusion principle for tracking multiple objects. Proc. IEEE International Conf. on Computer Vision, vol. 1 pp. 572-578. Nelson, D. W., and Sommers, L. E. (1982). Total carbon, organic carbon and organic matter. In Methods of Soil Analysis. Part 2. Agron. Monogr. 9. ASA and SSSA, Madison, WI. pp. 539-577. Nolan, B. T., Baehr, A. L., and Kauffman, L. J. (2003). Spatial variability of groundwater recharge and its effect on shallow groundwater quality in southern New Jersey. Soil Sci. Soc. Am. J. 2: 677-691. Olsen, S. R., Cole, C. V., Watanabe, F. S., et al. (1954). Estimation of available phosphorus in soils by extraction with sodium bicarbonate. USDA Circ. 939, Washington, DC. Ortiz, B. V., Perry, C., Goovaerts, P., et al. (2010). Geostatistical modeling of the spatial variability and risk areas of southern root-knot nematodes in relation to soil properties. Geoderma 156: 243-252. Richards, L. A. (1954). Diagnosis and improvement of saline and alkaline soil. USDA Handbook. No. 60. U.S. Govt. Print. Office, Washington, DC. pp. 60. Scull, P., and Okin, G. S. (2007). Sampling challenges posed by continental-scale soil landscape modeling. Sci. Total Environ. 372: 645–656. Skøien, J. O., and Blöschl, G. (2006). Scale effects in estimating the variogram and implications for soil hydrology. Vadose Zone J. 5: 153-167. Tang, G. A., and Yang, X. (2006). ArcGIS experimental tutorial of spatial analysis GIS. Beijing: Science Press. 384-385 (In Chinese). Walton, J. C., Roberts, R. K., Lambert, D. M., et al. (2010). Grid soil sampling adoption and abandonment in cotton production. Precision Agric. 11: 135-147. Wang, D. D., Shi, X.Z., Lu, X.X., et al. (2010). Response of soil organic carbon spatial variability to the expansion of scale in the uplands of Northeast China. Geoderma 154: 302-310. Wang, D. S., Liu, G. S., and Li, Z. H. (2002). Tobacco cultivation. Science and Technology University Press, Hefei, China (In Chinese). Wang, L., and Wu, J. (2008). Spatial variability of heavy metals in soils across a valley plain in Southeastern China. Environ Geol. 55:1207-1217. Wang, X. Z., Liu, G. S., Hu, H. T., et al. (2009). 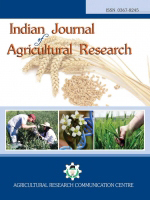 Determination of management zones for a tobacco field based on soil fertility. Comput. Electron. Agric. 65: 168-175. Webster, R., and Oliver, M. A. (1992). Sample adequately to estimate variograms of soil properties. J. Soil Sci. 43: 177- 192. Wei, Y. C., Bai, Y. L., Jin, J. Y., et al. (2009). Spatial variability of soil chemical properties in the reclaiming marine foreland to Yellow Sea of China. Agric. Sci. China. 8: 1103-1111. Weindorf, D. C. and Zhu, Y. (2010). Spatial variability of soil properties at capulin volcano, New Mexico, USA: Implications for sampling strategy. Pedosphere. 20: 185-197. Wu, C. C., Chen, X. W., Ma, C. L., et al. (2004). Research on reasonable distances of soil sampling and fertilizing based on GIS in precision agriculture. Trans. ASAE 35: 80-83 (In Chinese). Yao, Z. S, Wolf, B. J. M., Chen, W. W., et al. (2010). Spatial variability of N2O, CH4 and CO2 fluxes within the Xilin River catchment of Inner Mongolia, China: a soil core study. Plant Soil 331: 341-359. Yasrebi, J., Saffari, M., Fathi, H., et al. (2008). Spatial variability of soil fertility properties for precision agriculture in Southern Iran. J. Appl. Sci. 8: 1642-1650.